I really like this design. The tree doesn't take the focus away from the stone . 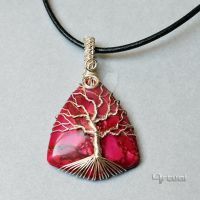 Beautiful, I love the tree and how they complement each-other with the stone. Without the tree it would be missing something, but as you said, the tree does not obscure the stone. Thank you . Yeah, I don't really like "cluttered" designs. I prefer it to let the stone shine . Gorgeous! I'd like to see this design with the tree done in copper or gold to contrast with the rest in silver. Just need a Labradorite that's more blue at the top. Beautiful design! That's a good idea, maybe I'll try it. I adore copper, but I don't like how it tarnishes fast. I like the patina myself, and then a polish over for highlight. Gives a nice "earthy" look to things. Some of the people I talk to at the craft store say there are products you can spray on the piece to stop the oxidation. Never tried it though. It doesn't take much to give the pieces I've made a quick buff, so I keep it natural. Of course you could use a copper enamel that doesn't tarnish too. Either way, I hope you find a labrodorite to try it. I'd love to see how it comes out. Thank you , it's one of my favorites too!